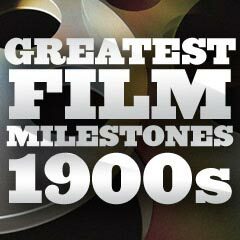 1909 There were about 9,000 movie theaters in the United States. The typical film was only a single reel long, or ten- to twelve minutes in length, and the performers were anonymous. Acting in a movie was looked upon as degrading compared with stage acting, so actors were never identified by name. 1909 The Selig Polyscope Company established the first permanent film studio in the Los Angeles area, at 1845 Allesandro Street (now Glendale Blvd.) in Edendale [present day Echo Park]. The first dramatic film to be completely made on the West Coast, in Los Angeles, California, was debuted by Selig - In the Sultan's Power (1909) by director Francis Boggs. 1909 The first feature-length film produced in the US was Vitagraph's Les Miserables (1909) (each reel of the four-reel production was released separately over a two-month period) - it was based on Victor Hugo's novel. 1909 The New York Times published its first movie review on October 10, 1909 - a report on D.W. Griffith's Pippa Passes; or The Song of Conscience (1909). 1909 Director D. W. Griffith's Biograph short A Corner in Wheat (1909) marked the first use of "freeze-frame" (actually an extended, static tableau of actors standing motionless) for jarring, dramatic effect in a shot of a breadline at a bakery. It also included an early instance of contrasting, parallel action cross-cutting. 1909 The New York Times coined the term 'stars' for leading movie players. 1909 Director Siegmund Lubin, the first Jewish-American film-maker, shot the dramatic short 3 minute film The Yiddisher Boy (1909). It was notable as the first film with a flashback, showing a boyhood street fight with thugs 25 years earlier on the Lower East Side. The paths of the two individuals (Moses and Ed) involved in the fight would cross 25 years later. 1909 An American court ruled that unauthorized films infringed on copyrights, in a case over an early film version of Ben-Hur (1907). As a result, film companies began buying screen rights to books and plays. 1909 Broadway star Mary Pickford signed on to appear in D.W. Griffith's (and Biograph) 10-minute short silent drama The Violin Maker of Cremona (1909), an Italian costume piece. It was Pickford's second film, although her first credited film. [She had earlier appeared as an extra in Her First Biscuits (1909), a comedy starring the first "Biograph Girl" Florence Lawrence.] In 1909 alone, Mary Pickford played 45 film roles for D.W. Griffith. 1909 Comedian Ben Turpin was mentioned in a trade journal, and became the first American film actor to have his name published. 1909 Cameraman Billy Bitzer became the first to film entirely indoors using artificial light. 1909 35 mm width with 4 perforations per frame was recognized as the international standard film gauge. It has remained the dominant film gauge since that time. 1909 Siegmund Lubin sold his chain of theaters, incorporated the Lubin Manufacturing Company, Inc., and built a huge new film studio in North Philadelphia, called "Lubinville" (which he began to occupy in 1910).